It is unbelievable how you continue to amaze us each week with your creativity! A myriad of flora and fauna appeared on your clean and simple cards and projects...to the delight of this former science teacher! Thank you so much for participating in what I am calling the "Back to Nature Challenge" and for supporting us at The Paper Players. We really do appreciate you! So what caught the eyes of the Design Team this week? Check it out! There were so many wonderful creations this week but Nicole’s Aviary card really caught my eye. Firstly, she used a clean and simple layout but punched it up with some adorable details! I love the seam binding bow on the fussy-cut cage and her use of the large tree as a branch is genius! I love all the escaped birdies and how the owl looks like he is plotting his escape! Secondly, she incorporated both flora and fauna in her creation for maximum effect! All these details put together made Nicole my choice for A Cut Above…congratulations Nicole! 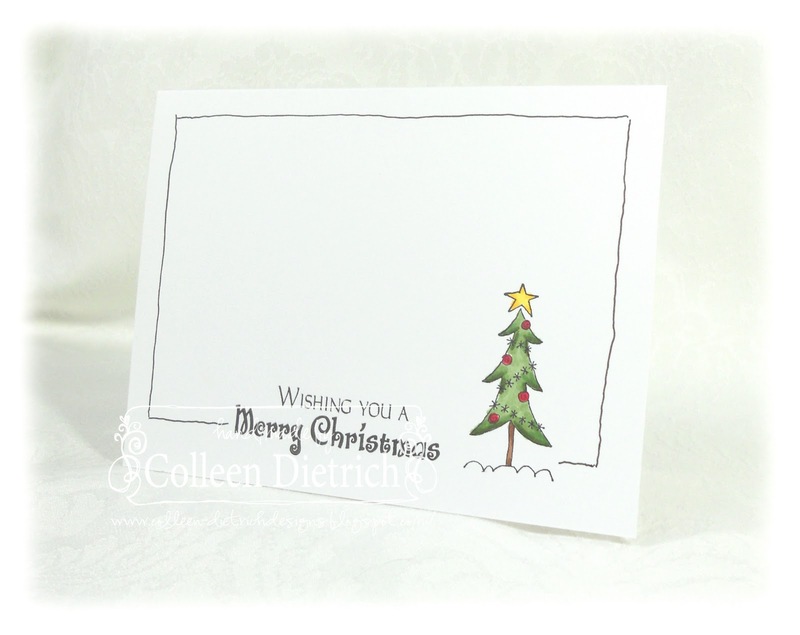 I was drawn to Colleen's clean and crisp card right away. I love the simple, beautifully colored tree surrounded by the hand drawn lines. An element of this card that I fancy ( and need to try) is the sentiment that is placed at the bottom of the card and is incorporated into the border - so clever! My eye just naturally moves around the card - no layers, no accessories just a well designed, clean and simply beautiful card. Congratulations Colleen, for being my choice for Cut Above. 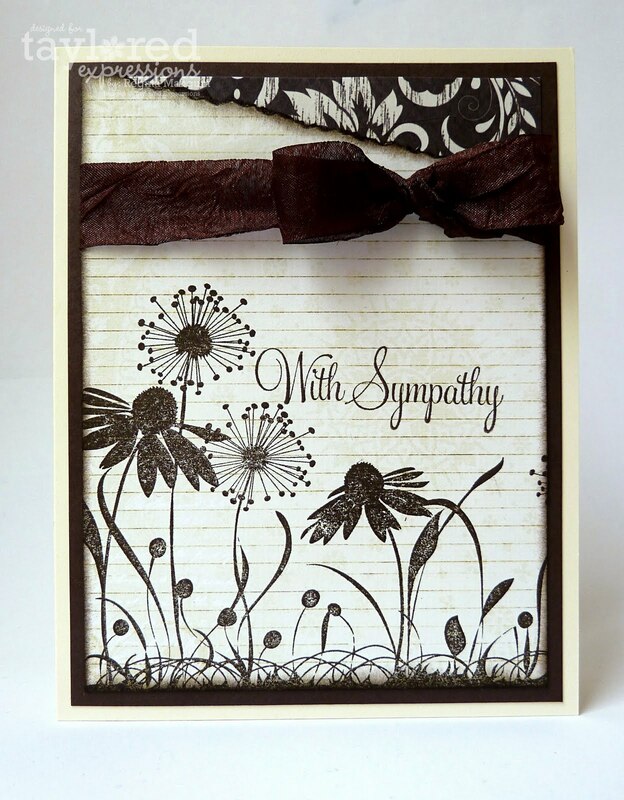 Regina's thoughtful sympathy card stood out to me with its simple monochromatic tones, yet the paper she used gave it a fresh updated look. The beautiful bow and the torn edge with the gorgeous brocade paper peeking out at the top stepped it up another notch, making this card a real treasure! Congratulations, Regina, for being my Cut Above! 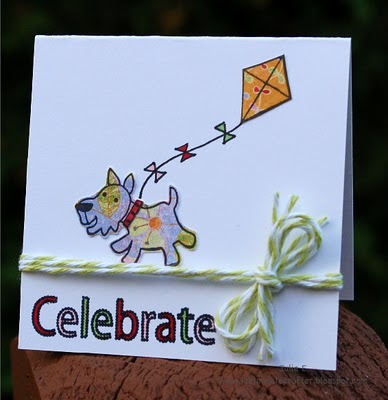 This little pup is so cute, I just kept coming back to view this card and the second card that Julie made accompanying this little gem. Both are very well done. The pup here is paper pieced as is his kite and bows, and I just love that look. Well done, this is just so cute! Congrats Julie for two cards well done, you are my Cut Above this week! What a fabulous week of submissions, I loved visiting your blogs to see the Clean and Simple designs you created with plants and animals. Susie's card kept drawing my eye, I love that she used the "Flower Garden" embossing folder and highlighted the image with her Wisteria Wonder marker, how beautiful. The clean white paper, embossed and then highlighted, all perfectly tied together with a yellow ribbon was such a great way to create this clean and simple masterpiece! Congratulations Susie, on being my Cut Above this week. Well girls, you all outdid yourselves this week! There were so many fabulous submissions that it was really hard to choose just one. I went digital this week and chose Erica's CAS layout created with MDS. She kept the layout very simple using the cutest DSP and a few embellishments. Esper, her daughter, is the real star here and the CAS layout allows her to be front and center. Erica has a great tutorial on her blog on how to create this simple, but adorable page. Her blog definitely provides lots of inspiration for those of us wanting to delve into the digital world of paper crafting. Erica, congrats on being my Cut Above this week. I love your work! 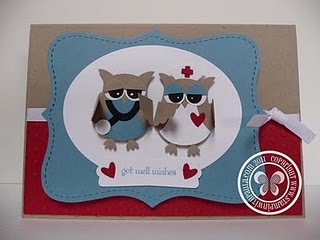 Anne Marie's Choice - Paula S.
What a HOOT and super-cute! I just love Paula's adorable little get well duo and all of their fun details. I especially like the dimensional wings she added and the fun color combo. This little doctor and nurse will surely brighten anyone's day! Congratulations to you, Paula! You are my choice for A Cut Above this week with this fabulous feel-good card! Nothing screams fall like beautiful foliage! And with a thump from a sextet of Stampin' Write Markers, Cindy Hall transformed the bare trees from Lovely as a Tree into specimens which are truly a delight to behold! I love the two scenes she created, as well as the center sentiment. The ribbon and buttons add texture, while the colors exude warmth. Congratulations, Cindy, on being my choice for this week's Headliner! Thanks to all of our participants this week. We love seeing your projects and hope you'll join us tomorrow for a fabulous sketch challenge from Anne Marie! 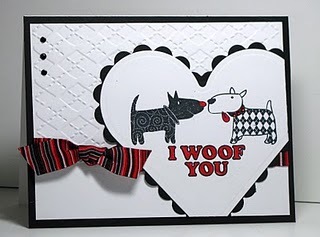 Thank you so much for selecting my "woof you" card. I was absolutely thrilled when I realized that the two dogs and the sentiment fit inside a heart...I'm glad you liked it too! Thank you for selecting my aviary card for the "A Cut Above". It is the first card challenge I have won. So again thank you so very much. Thank you for choosing my embossed card as A Cut Above! And...thanks for the wonderful comments you left on my blog!